Strictly speaking, does the world absolutely need another Farmville clone? Probably not, but with so many of them out there, I’m glad that a few have taken the time to make really outstanding iPhone versions, like Farm Story. While not quite as dynamic as Zombie Farm, Farm Story is definitely one of the smoothest and best looking farming sims available. The bright, stylized graphics are imminently well-suited to the iPhone’s small touch screen. Farm Story’s visual design isn’t especially original, but it is beautifully rendered and creates a look that is similar to, but definitely distinct from Farmville. While you don’t get a friendly little farmer running around, the overall farming controls are beautifully smooth. I really appreciated how they remember your last action, so you don’t need to keep reselecting for each plot of land, and the touch controls work very nicely for navigating around the farm. Easily collapsed menus help preserve the limited screen real estate, and while scrolling through the many menu screens can get a little tedious, the actual scrolling mechanism works perfectly. Farm Story’s social networking system may be my favorite for this sort of game, since it’s NOT on Facebook and doesn’t even require an email address. Instead, all you have to do is choose a nickname and then you are free to browse the community, visit other people’s farms, and add friends. Although you can’t water your own crops, you can visit other farms and fertilize or water their crops up to 5 times. Fertilized/watered crops give extra XP, so visiting other farms and leaving comments helps increase your chances of other people returning the favor. Making friends and visiting farms also lets you see all the different kinds of layouts available and help you plan for the best looking farm. In terms of crops, trees, and decorations, the game has quite a lot of spiffy options available, no doubt with more on the way. Items cost coins and diamonds, although the cheaper amongst you may be dismayed to learn that you cannot earn diamonds, only buy them. That said, the game is now entirely free after starting out at $4.99, so it’s not worth complaining too loudly. Farm Story doesn’t reinvent the wheel or even add any particular innovations, but sleek graphics, fluid controls, and Push notifications make this one of the best and most affordable farming sims out there. Unsurprisingly, the game is very repetitive, as are all farming sims, but if you’ve been wanting Farmville for the iPhone, Farm Story is most definitely worth a try. AppSafari review of Farm Story was written by Tracy Yonemoto on June 1st, 2010 and categorized under App Store, Free, Games, Resource Management. Page viewed 15718 times, 11 so far today. Need help on using these apps? Please read the Help Page. one more thing how do you get those cute designs such as water and happy faces?…. I’m playing this game on my Iphone in Thailand. There was no problem after I downloaded it and played it via wifi for a while. Then since I played it via 3G one time, I got a trouble thing. I cann’t open it via wifi anymore. So every time I want to check my farm when I stay in wifi area, I have to close my wifi receiver first, then I can open it via 3G. Few weeks ago, I donwloaded Farm story flower vision, same thing happen again. It’s so trouble. It’s been claimed that the game is for free. So how come shortly after the download I get 5 emails from iTunes with bills of 39.99 EURO each? The download I authorised by logging into the iTunes. The 5 charges though haven’t been followed by any authorisation. This way my iTunes account info and my credit card details have been misused. How can I claim for compensation? I also have been charged $59.99 for something after downloading this. Further to charging without authorization, I contacted the developer of the game, they sent me to iTunes, saying that they can’t reverse the charges. iTunes told me that I should better secure my account information, and that I should contact my bank. My account information is secure. While playing the game that was supposed to be for free, I’ve been charged nearly 200 eur without my authorization. I don’t understand why and how. Neither the developer of the game nor iTunes even try to answer this question. All they do is trying to get rid of me. My bank advised me to launch an investination. I will – I’m not sure whether iTunes understands that this investigation will be on checking the business practices of iTunes. iTunes charged people without asking them and then act as if nothing happened. If the same happened to anyone of you, please share. I am from CAMBODIA. I am eddicted to this game. It is free but if we need nice enhancement, it will not be free. Need to buy in real $$$, so be aware!!! I heard that iTune store account could be hacked, so it please be cautious. It may happen often cos iTune have no other secure verification when purchasing. A password is not Enough!!! I love farm story. You can get extra diamonds by adding free apps, there are adds when you first open farm story. It loads better then any other app unlike farmville. stacey- you go on itunes app and download a free emoticon app and that allows you to use all the symbols. how do u send gifts and get ur gifts that people send??? agreed with kayla i am at a lost of how to access the gifts people sent me. help! how do you send and receive gifts? How do I water other farms? I can’t figure it out? Stacey – you need to download an app called emoji. Heather – go to Social in the main menu, then community, then you will see other people playing on the app. press visit and you will be transfered to their farm. Then click on a tree or an unwatered crop and press it twise to water. You cannot water something that already has a drop of water hanging from it…Have fun! I am addicted to this game and playing since long. but still confused in many matters.like what to do with all that gifts received and sent? app called emoji ??? what one works for farm story. there’s alot of different ones to download. I enjoy play Farm Story. I’ve Farmville for my iPOD touch but I enjoy Farm Story more. It is easy to use and unlike Farmville I don’t have to go to my computer to make some things happen. While Farm Story it is easy to harvest crops I always have problems on Farmville using my tractor, Seeder, and Harvester on the iPAD Touch but with Farm Story just tap and your done. Be careful because if you buy the gems they are for real cash. It is trick and does not provide any warning. I’ve made some unintentional purchases and now I am claiming Itunes a refund. Why should someone pays $5,00 for 24 gems? Marco, it does warn you. You have to accept the purchase before you get charged. Two issues. First, I hate the pop up to sell chests. It is very annoying. Stop it! Please! Second, I get knocked offline more and more. Is your system overloaded? My 11 year old got this App 5 days ago and enjoyed it. But I have a concern. She met a “boy” on her who now has her email, her picture, and her friends cell phone. (she does not have a cell). We check her email and saw this. She thought nothing of it but we stopped it. I gotta feeling he is not who he says. What can/should we do. If he’s bad he’s gonna find other girls .. But there is no section to type anything??? My grandaughter downloaded this ap for free apparantly then my credit card had 4 X 199.99 charged to it as well as 150.00 and numerous 30.00 charges totaling 750.00 an so angry she was able to this without any authorization at all. Still trying to get my money back this app should be gone. I’m so sorry that this happened to you. 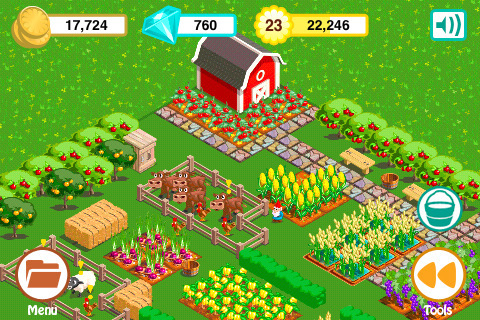 Farm Story does have Gem purchases where you can download, essentially, graphical items through real money. A lot of free apps do this. Unfortunate that you didn’t discuss the dangers of app usage with your granddaughter before hand. These games connect to the internet so dangers will be present. Keep in mind that other apps have features like public chat, which are usually riddled with people trying to ask for young girls pictures and locations of where they live. Depending on her age, this could be an oppritunity for you to teach her the value of money by making her do chores or work a job and pay you back. Otherwise, she did need your authorization. The AppStore password was what she needed. You could cancel payments and file a dispute against them to get them, but if you allow her to be on the internet or if you ever handed her a credit card, you really need to speak to her about financial responsibility too. Hmm, that is rather unfortunate. Well, if I ever come across apps that deal with real money in such a way, I’ll make sure to emphasize it in the review as a warning. Farm Story was a nice alternative for me since my droid is my only internet connection.. now I am annoyed. I have almost a hundred diamonds… I payed two seperate orders for in the last two weeks. Now it say’s I am not connected to the internet when I am. Usually I reboot my phone when this happens and am able to get back online. Now I can not open app right after my last purchase of diamonds. Which I only bought because this app was freezing up on me before and I accidently bought something I didn’t want with my free diamonds I earned, like by down loading the other games, leveling up, etc. I am annoyed!! !